With the Oracle Phase now moved from the future to the past, we would like to announce the Regional and Superlative winners for this “blitz” AvA competition. While there did appear to be some idiosyncrasies in official VP at certain knpoints in the phase, a result of some of the experimental functionality, we can confirm that these results are based on the leaderboard standings. In the coming days, we will publish an analysis of the Oracle Phase, once our data maesters have completed their work. We are happy to announce the first set of Superlative Title winners for AvA. 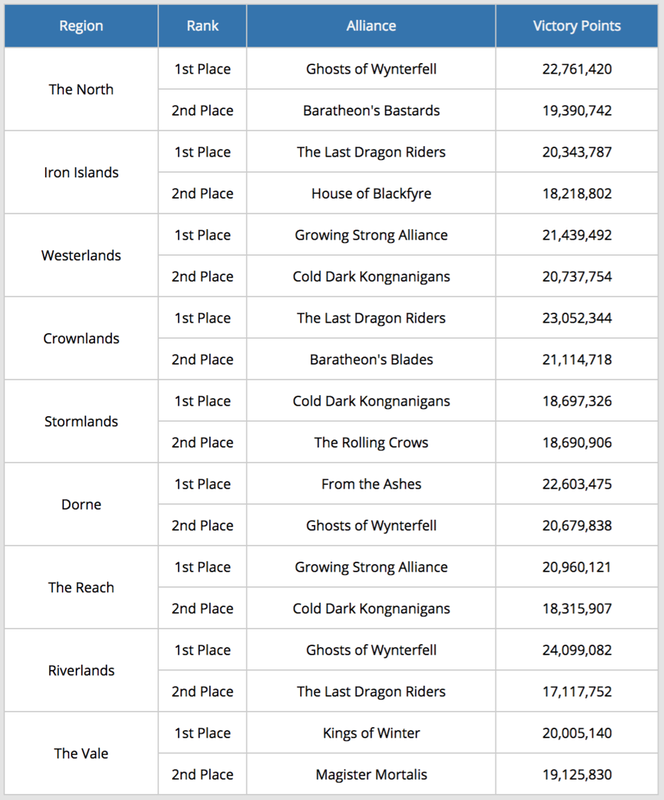 Please keep in mind, the first and second place Alliances in any region were not eligible for that region’s Superlative Title. They could, however, win Superlative Titles in other regions, or alternatively, the All Westeros Superlative Title. The winner of the All Westeros Superlative Title was ineligible to win any regional superlative. Superlative Titles will be granted the week of November 13-17. Congratulations to all participants this experimental Phase and thank you for participating. See you at the next AvA!